When’s the last time you caught a ride in an autogiro? PLENTY OF BLUNDERS AND BLOOPERS SHOW UP IN THE HISTORY OF THE AIRPLANE. Time and again, inventors (and investors) staked their hopes on dreams that never quite came true or on ideas that went nowhere. As some designers created the classic aircraft of the past century, others proceeded through numerous wrong turns, and here are ten of the most memorable. The Flyer that the Wrights experimented with a few years later could never have flown such distances without the intercession of a pilot. It was an unstable craft equipped with control devices; with them, the pilot could make the biplane climb, descend, and turn. Unstable aircraft, built in the Wright style, flourished into the l930s, when airplanes grew so large and were capable of flying so far that pilots wearied of constantly struggling with controls during long flights. At that point, engineers began building some stability back into large bombers and airliners to ease the pilot’s workload. Even so, no one returned to inherently stable craft and the flat skidding turns of Langley and Farman. Reinforcing the notion that the Wrights invented the airplane but the Germans invented everything after that, the first aircraft to fly with forward-swept wings was German: The Ju 287 appeared in August 1944. It had already been discovered that aircraft with wings swept back produced less drag at high speed but were difficult to control at low speeds. (Big surprise: The first aircraft with wings swept back was also German.) Ju 287 designer Hans Wocke reasoned that reversing the sweep should continue to reduce drag at faster speeds but would improve control at lower speeds. He was right, but his design was slightly ahead of the materials available to build it. The Ju 287 made it through several test flights, but its aluminum wings flexed upward and created concern that they would break off from the airplane. Lighter composite materials, which offered both stiffness and strength, provided another opportunity to experiment with forward sweep. 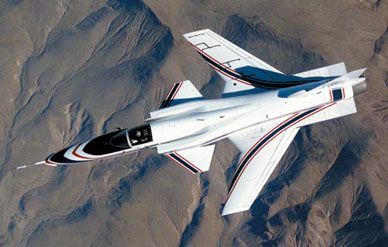 They led to the Grumman X-29, an oddly graceful jet with a patriotic paint job. The U.S. Defense Advanced Research Projects Agency commissioned and tested it at NASA’s Dryden Flight Test Center in California between 1984 and 1992. The X-29 was extremely unstable and therefore highly maneuverable. Its pilot, relying on a digital flight control system, could maneuver at high angles of attack. Air moving over the forward-swept wings tended to flow inward toward the fuselage rather than outward toward the wing tips; as a result, the wing stalled at the roots before stalling at the tips, and the ailerons near the tips continued to function. So why aren’t future fighters showing forward sweep? The X-29 produced too much drag. Designers, including those at the Sukhoi bureau in Russia, have turned to other ways of achieving maneuverability at high angles of attack. Sukhoi’s Su-47, which may be fielded to contend with the F-22 Raptor, first flew as the S-37 in the late 1990s with forward-swept wings. Last year, the Russian military elected to continue its development with conventionally swept wings. Pick any airliner flying today: It’s probably powered by turbofan engines. With their gaping intakes and enormous, multi-blade fans, turbofans revolutionized aviation during the late l960s, propelling aircraft of undreamed-of size: the Lockheed C-5A and Boeing 747. They were able to do so because the great size of the fans—some are as large as 10 feet in diameter—enabled them to move huge quantities of air, increasing the engines’ thrust. The turbofan also offers superb fuel economy. Most of the air pushed rearward by the fan bypasses the engine’s combustion chamber and flows at relatively slow speed, increasing the engine’s effective thrust without burning additional fuel. But after l980, when the price of oil had climbed higher than the aircraft it fueled, General Electric sought to develop engines that would push the fanjet’s efficiency still further.